The memorial is an upright stone stele twelve feet high containing an inset bronze panel almost seven feet tall. The panel depicts a female warrior in low relief wearing a close-fitting helmet with eagle on top, robes and cape, and clasping a shield with the proper left hand. The shield tip rests on ground next to proper left foot. The warrior holds sprigs of laurel against her breast with the right hand and gazes ahead with a solemn expression on her face. Inscriptions to include the names of 37 men who died during war service appear on the shield. The word “colored” is used to segregate the names of three African American at the bottom of the list of names. The inscription on the stele’s front, "Dulce et Decorum Est Pro Patria Mori" is a line from Roman poet Horace's odes, roughly translated as "It is sweet and fitting to die for your country." The poem inscribed on the back was written by a local physician, Dr. James Sprunt. This inscription ends with four lines in quotation marks from Theodore O'Hara's elegiac poem, "Bivouac of the Dead." Rear: THESE NEW HANOVER COUNTY / MEN WHOSE NAMES WE PERPETU- / ATE BY THIS MONUMENT WERE / NUMBERED THOSE CHOICE / SPIRITS WHO AT THEIR COUNTRY’S / CALL IN THE GREAT WORLD WAR / LEFT ALL THAT WAS DEAR TO / THEM, ENDURING HARDNESS, FACED / DANGER AND FINALLY PASSED OUT /OF SITE OF MEN BY THE / PATH OF DUTY AND SELF SACRIFICE / IN PRISON, IN HOSPITAL, ON THE / BATTLE FIELD, ON HOSTILE SEAS, / IN UNCHARTED REALMS OF AIR. / THEY FOUND SUPPORT AND CON- / SOLATION IN THE BELIEF THAT / THEY WOULD NOT BE FORGOTTEN / “ON FLAMES ETERNAL CAMPING GROUND / THEIR SILENT TENTS ARE SPREAD, / AND GLORY GUARDS WITH SOLEMN BOND / THE BIVOUAC OF THE DEAD.” / 1914 1918 / A.D.
$6,000. Approximately $15,000 for 2014 move and restoration. 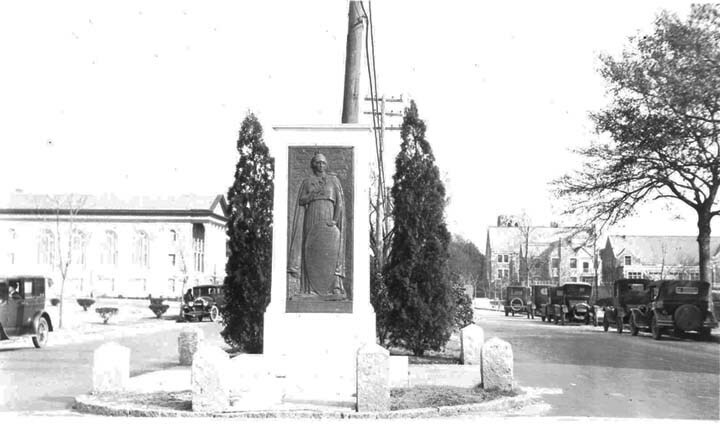 The World War Monument on Market Street, at 13th, was dedicated on Decoration Day, May 30, 1922. The festivities began with a concert on American Legion lawn and the decorating of graves by the Legion post’s Women’s Auxiliary. A parade was then formed and moved to the monument site. The ceremony opened with a prayer and the singing of “America” before being presented to New Hanover county and unveiled by children of deceased servicemen. Mayor James Cowen then introduced the day's featured speaker, U.S. Senator Pat Harrison of Mississippi. After the address by Senator Harrison a squad from the Wilmington Light Infantry fired a salute over the monument and taps played to end the ceremony. For the 2014 rededication World War One historians were the featured speakers: Dr. Janet Davidson of the Cape Fear Museum of History and Science, Dr. Taylor fain of the University of North Carolina Wilmington and Sion Harrington, formerly of the N.C. Office of Archives and History made presentations. Speeches were also made by politicians, including Mayor Bill Saffo, County Commissioner Woody White, and U.S. Rep. Mike McIntyre. The memorial was described by newspaper articles of the time as “a structure of artistic grandeur,” and one of the prettiest pieces of work in the entire country.” It is a unique piece of work which gives credit to these claims. Most memorials erected to World War One dead were of a cookie cutter or mass produced variety. Often they were simply slabs of stone or metal with names of the dead or those who served although Memorial drinking fountains were also popular at the time. 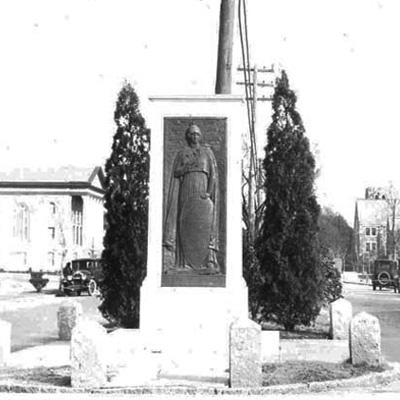 There were few attempts in North Carolina to use commissioned pieces of art in World War One memorials. Several statues were placed but the best of those were the mass produced “Spirit of the American” Doughboy. Before moving to the high school grounds the memorial was hit by cars at least twice. In 1923, one of these accidents broke the stone in two, requiring replacement. The monument stands at a small city park on the Riverwalk that runs 1.8 miles along the Cape Fear River in the old historic part of the city. The park is adjacent to and north of where the United States Coast Guard Cutter “Diligence” docks. The memorial stands on the grass surrounded by bushes and shady trees. For more than 50 years, the memorial sat at Market and 13th streets, in the median of the main thoroughfare through town at New Hanover High School. In 1973, due to the construction of an overpass, the memorial was moved and placed in front of the school. In early 2014, a group of people gathered to explore the idea of restoring, cleaning, and moving the memorial to the Riverfront which was accomplished later that year. The re-dedication took place on November 11, 2014.